The Game Bag is used by hunters wanting to keep a record of their hunting expeditions. The database comes with a list of game animals and weapons however the user can add new game animals, new weapons, gauges for shotguns, calibers for rifles, etc. Game Bag is used by hunters wanting to keep a record of their hunting expeditions showing the animals bagged during each hunt. 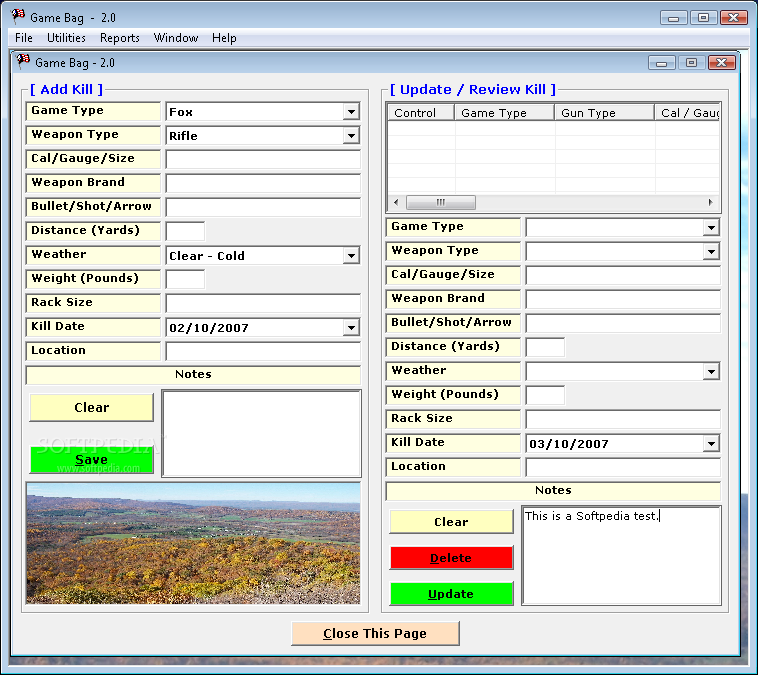 The database comes with a list of game animals and weapons however the user can add new game animals, new weapons, gauges for shotguns, calibers for rifles, arrow types for the bow hunters, shot size, bullet weight, weapon brands, weight of the animal bagged, rack size when applicable, location, weather conditions, etc. With just a click of the mouse, the user can generate a report showing all records along with a handy address list of hunting partners, land owners, state and federal wildlife departments, etc. Unlimited records allow for keeping records for years and expeditions to come. A great hunting diary. With just a click of the mouse, the user can generate a report showing all records along with a handy address list of hunting partners, land owners, state and federal wildlife departments, etc. An unlimited records capacity allow for keeping records for years to come.